The formation and alteration of the oceanic lithosphere represent one of the main processes for energy and chemical exchanges between the deep Earth and its outer envelopes. However, the steep thermal gradients in these environments mean that the physical and chemical mechanisms controlling these exchanges remain poorly understood, especially at the main thermal and lithological boundaries. Yet, these interfaces are the main transitions for the physical and rheological properties of rocks, such as deformation, permeability, and viscosity, that control melt focusing and transport from the partially molten mantle to the surface, and the influx of seawater into the cooling oceanic lithosphere. Understanding these processes is fundamental also because of their socio-economic and environmental impacts: they give rise to hydrothermal systems that produce economically valuable ore-deposits and play a major (although still poorly quantified) role for the global carbon budget. Some hydrothermal reactions produce hydrogen and abiotic hydrocarbons, and these extreme environments are implicated in the origin and development of life. To understand these environments, it is necessary to comprehend and integrate the role of transport of magmatic melts and hydrothermal fluids through the oceanic lithosphere, and their feed-back on its physical and chemical properties that shape life habitats. 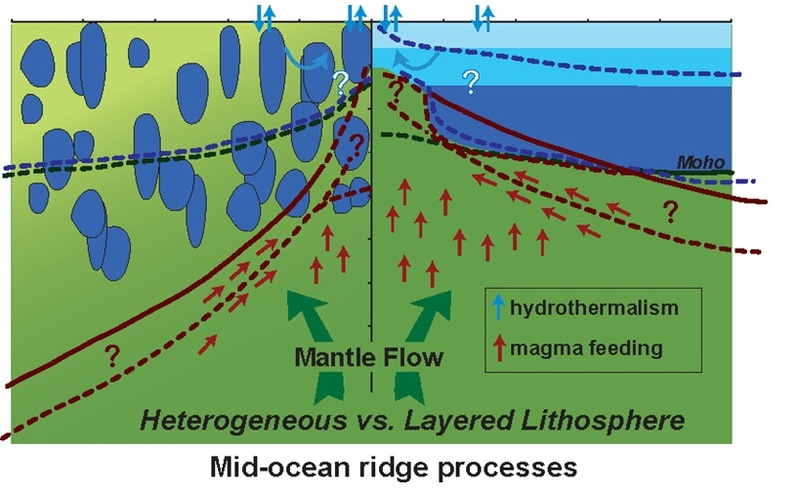 Traditionally the formation of oceanic lithosphere has been envisioned as a suite of mantle and crustal magmatic processes, followed by high- to low-temperature hydrothermal processes, which in turn support the development of rich and diverse ecosystems, each occurring in independent domains (magmatic vs. hydrous vs. biosphere) and the interactions and feedbacks controlling mass and energy transfers at their boundaries have been mostly overlooked. Understanding such complex natural systems will require a shift of approach encompassing multi- and trans-disciplinary training and the development of new scientific tools. ABYSS will provide comprehensive training programme for the next generation of European researchers on deep oceanic lithosphere-hydrosphere-biosphere systems; it will develop the scientific knowledge and develop methodologies to quantify these complex coupled processes and integrate observations into overarching theoretical and numerical models of the oceanic lithosphere. Integrate micro- to field observations and measurements over a large range of time scales from microbial life span (106-107 s) to global Earth dynamics (>1013 s).